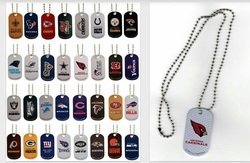 NFL DOG TAGS - $10.00 Please specify which team you purchasing to I can get your order packed and shipped out as quickly as possible. Use the below Paypal Button to make Your Purchase. Thank you.